Breast size can affect the way clothing looks on your body, the way you carry yourself and the way people respond to you. If you have a large bust and would like to minimize its appearance, there are techniques to help. 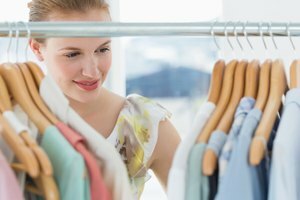 Aside from breast reduction surgery, your wardrobe can dramatically help to conceal or distract attention from your ample chest. Wear dark colors as opposed to white or light colors. Dark colors help to conceal a large chest whereas light colors can draw attention to your bust. Purchase a minimizer bra from your local department or lingerie store. These bras are specially designed to compress breasts and make them appear smaller. A well-fitting minimizer bra should be comfortable and still provide lift. Layer two sports bras to hold your bust close against your chest. Sports bras tend to be thin and breathe well, so wearing two is comfortable, supportive and serves to minimize a large bust. Avoid wearing baggy clothing. Baggy clothing can actually make you look bigger rather than disguise your body. Choose clothing that is well-tailored and fits your curves well rather than boxy, shapeless pieces. Wear v-neck tops. V-necks draw the eyes downward which helps to divert attention from your breasts. Avoid tight, high-necked tops that stretch across your bust as they can emphasize your size. Accessorize with bold, statement necklaces. Jewelry draws eyes away from your chest and focuses attention on other areas. Choose necklaces that lay across the collar bone and draw attention upward rather than longer, plunging necklaces which can have the opposite effect.